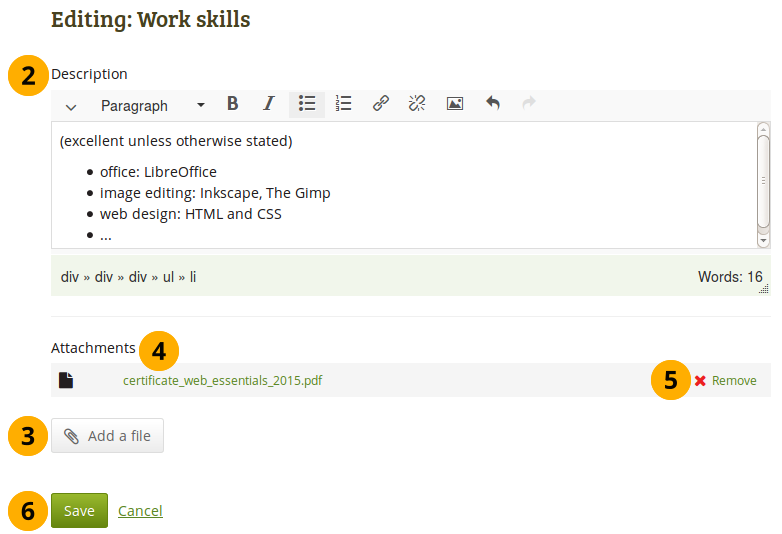 The résumé plugin allows you to create an online résumé / curriculum vitae. You can either publish your entire résumé or individual components of it in your portfolio. In the introduction you can write a Cover letter and also provide some Personal information. Go to Content → Résumé → Introduction and click the Edit button in the Cover letter section to enter the edit mode for the cover letter. 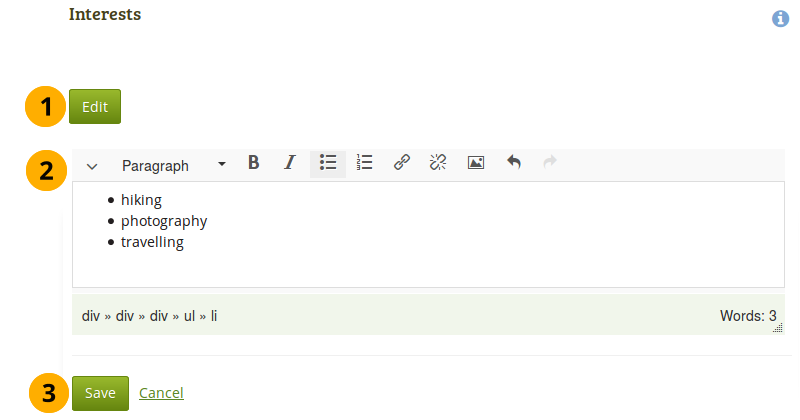 Click the Save button below the editor window when you are happy with your cover letter to save it for future use, or click the Cancel button to abort your changes. None of the fields under Personal information are required. You can choose to include as much or as little information as you wish. Most fields are free form fields. Mahara is being used around the world. Therefore, some information here or later on in the résumé do not apply to you. If you do not need them, you do not have to fill in the fields. Place of birth: Enter your place of birth. You can also enter the country you were born in. 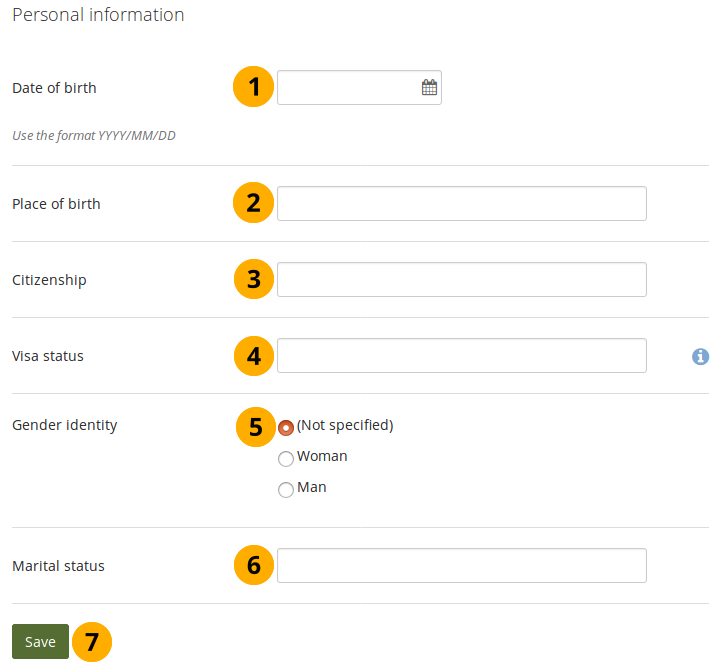 Citizenship: Fill it in as it is shown in your passport. Visa status: As employment laws vary between countries, you may wish to include your work or travel visa status within your résumé where relevant. Marital status: Provide it if it is relevant. Click the Save button when you want to keep that information. This part of the résumé allows you to create a record of your academic and professional qualifications as well as your work experience. You can enter as many qualifications for your education history as you want. Click the Add button to start a new entry. Start date: Provide the date for starting your qualification. This field is mandatory. 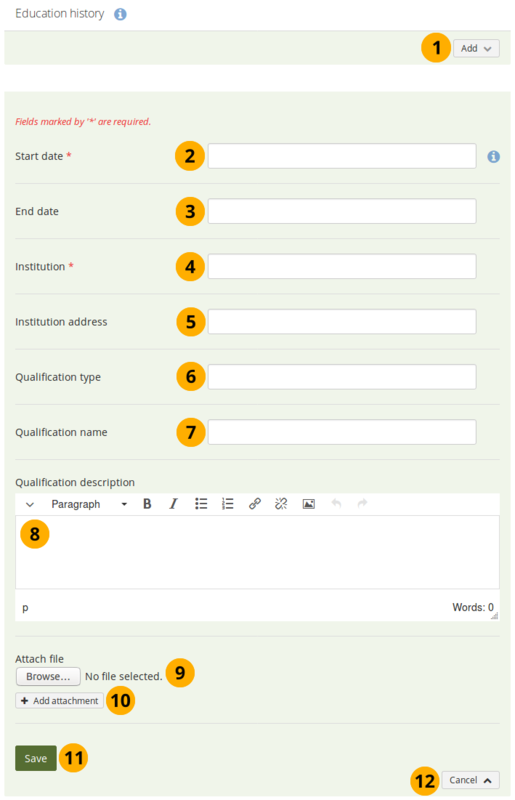 End date: You can fill in an end date for your qualification. You can enter the dates any which way you want. It is not a calendar date field because different résumés require different date formats. Institution: Enter the institution at which you worked on your qualification. This field is mandatory. Institution address: You can provide the address for your institution. Qualification type: Enter your qualification type if you wish. Qualification name: You can enter the name of the qualification you were / are earning. 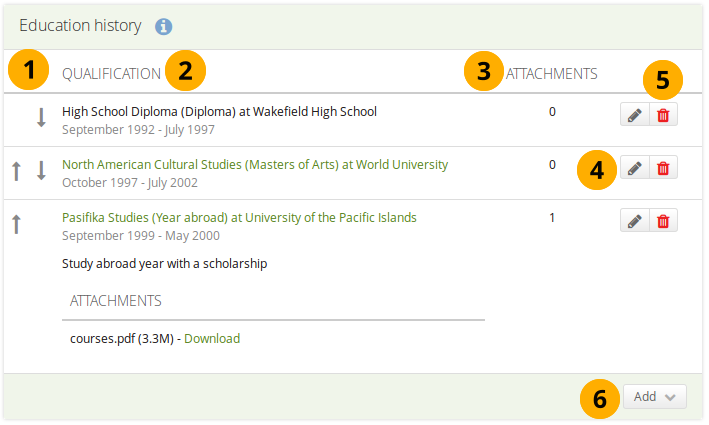 Attach file: Attach a file as evidence of your qualification. Click the Browse button to select a file from your computer. Click the Save button to save your entry. You can add a file only once. If you need to attach it to another item as well, you must upload the file again. When you edit your entry, you can attach additional files or remove files as you would do on the File(s) to download block. When you have filled in all your qualifications in your education history, you can re-arrange the individual items if necessary. Use the up and down arrows to change the order of the individual items. to make changes to an entry. You can enter as many jobs to your employment history as you wish. Start date: Provide the date for starting your job. This field is mandatory. 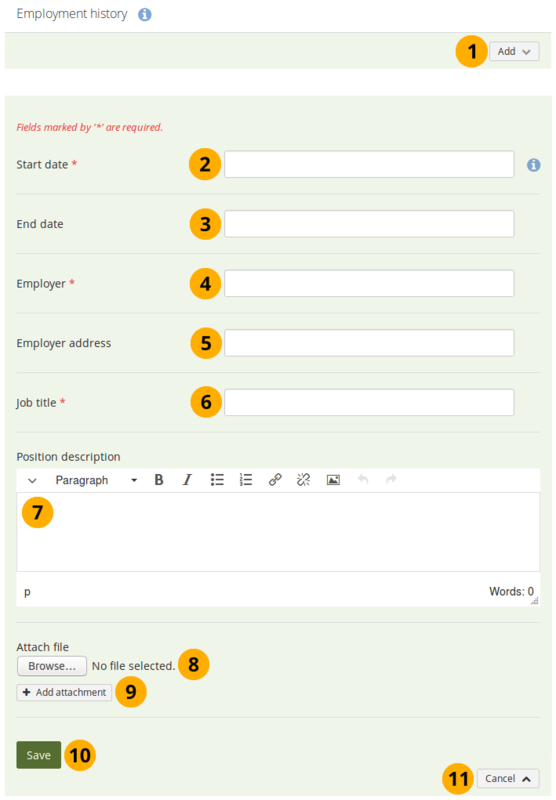 End date: You can fill in an end date for your job. Employer: Enter the employer at which you worked. This field is mandatory. Employer address: You can provide the address for your employer. Job title: Enter the title that you held. This field is mandatory. Attach file: Attach a file as evidence of your work. Click the Browse button to select a file from your computer. When you have filled in all your job positions in your employment history, you can re-arrange the individual items if necessary. The process of adding, editing and moving entries is similar to the process for Education and employment. Date: Provide a date when received your certificate, accreditation or award. This field is mandatory. Title: Enter the title of your certification, accreditation or award. This field is mandatory. 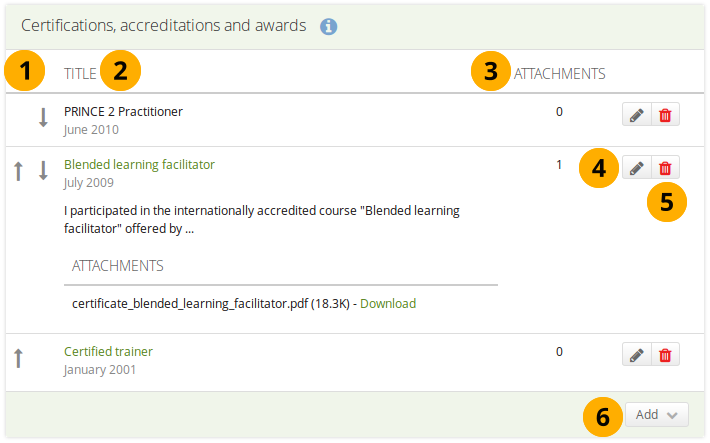 Attach file: Attach a file as evidence of your certification, accreditation or award. Click the Browse button to select a file from your computer. When you have filled in all your certifications, accreditations and awards, you can re-arrange the individual items if necessary. Date: Provide a date for your publication. This field is mandatory. Title: Enter the title of the journal or book in which your contribution appeared. This field is mandatory. 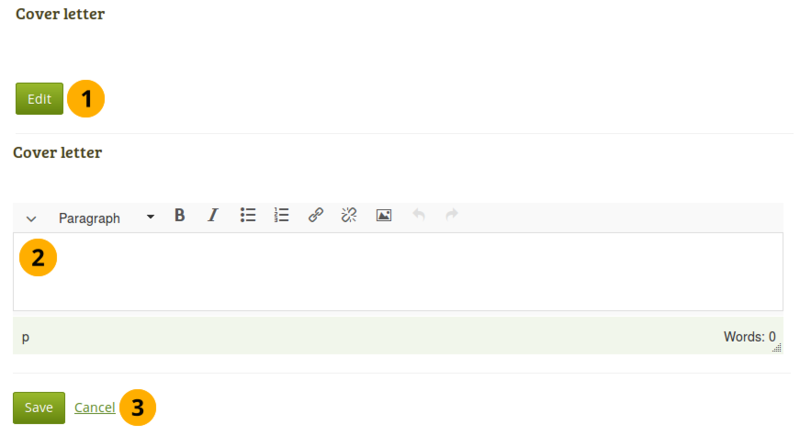 Contribution: Enter the title of your contribution. This field is mandatory. 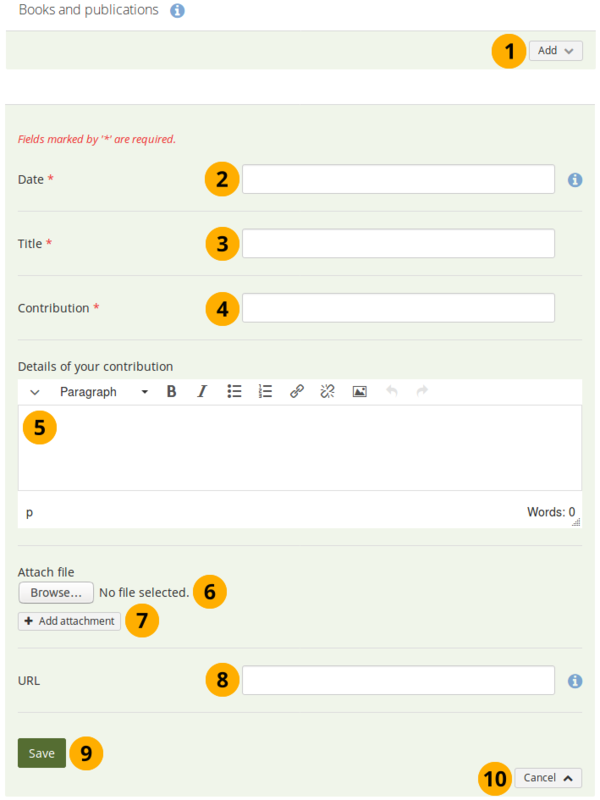 Attach file: Attach a file as evidence of your contribution, e.g. the PDF of the article. Click the Browse button to select a file from your computer. URL: Enter the URL under which your publication is accessible. 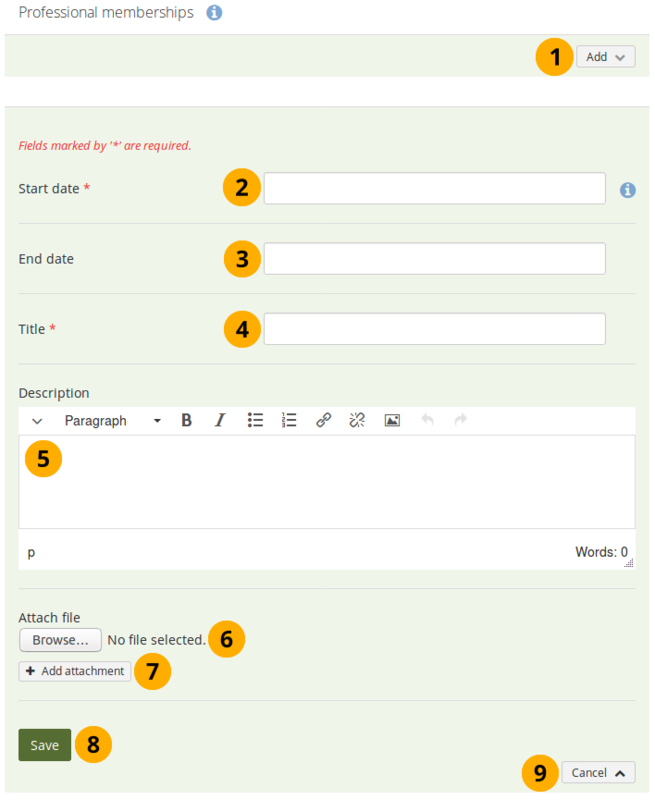 When you have filled in all your publications, you can re-arrange the individual items if necessary. Start date: Provide the date for joining the organisation. This field is mandatory. 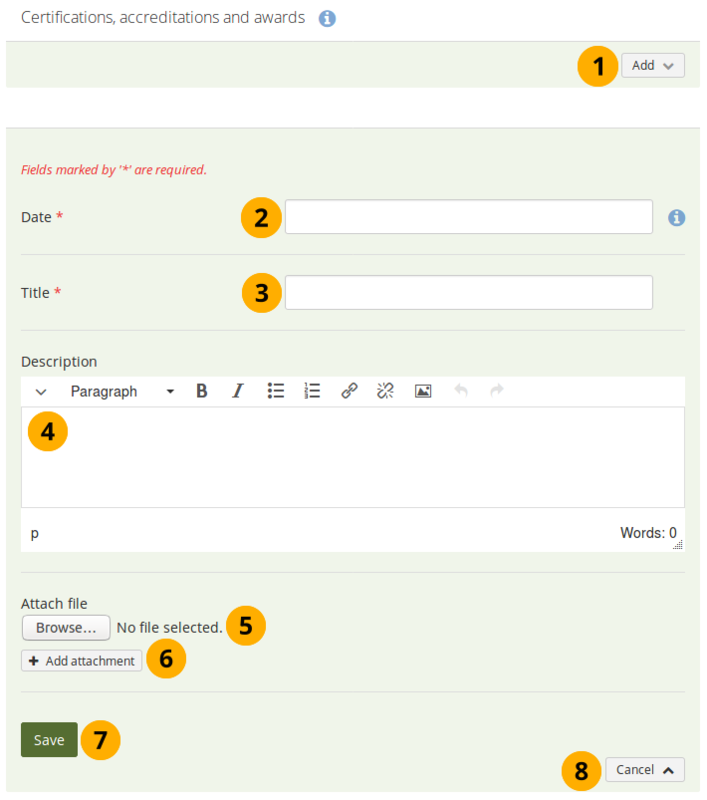 End date: You can fill in an end date if you left the organisation. Title: Enter the title of the organisation. This field is mandatory. Attach file: Attach a file as evidence of your membership. Click the Browse button to select a file from your computer. When you have filled in all your memberships, you can re-arrange the individual items if necessary. Personal or career goals are often provided in a résumé for employers to understand how a particular role might suit your ambitions. 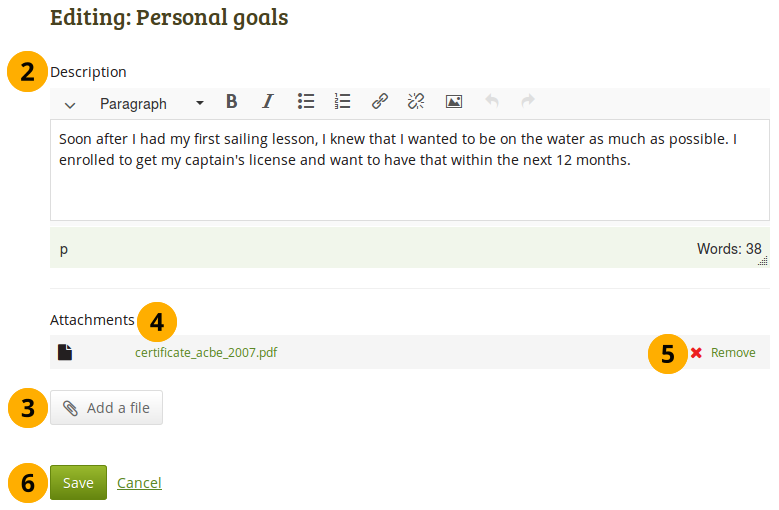 You can use the academic goals section to describe achievements you are seeking in your programme of study. You may include skills that you add here in your portfolio pages. Employers are always interested in what skills you can bring to a role. You can use this section to display the attributes that you would bring to a collaborative community or working group. to enter skills in one of the three skills areas. The Interests section allows you to list your personal and / or professional interests. This might include your hobbies, sporting activities, volunteer work, areas of research and expertise etc. Listing your interests will help employers form a better picture of who you are and what you would bring to their organisation. Click the Edit button to enter your interests. Write down your interests. You can come back at any time and edit them. 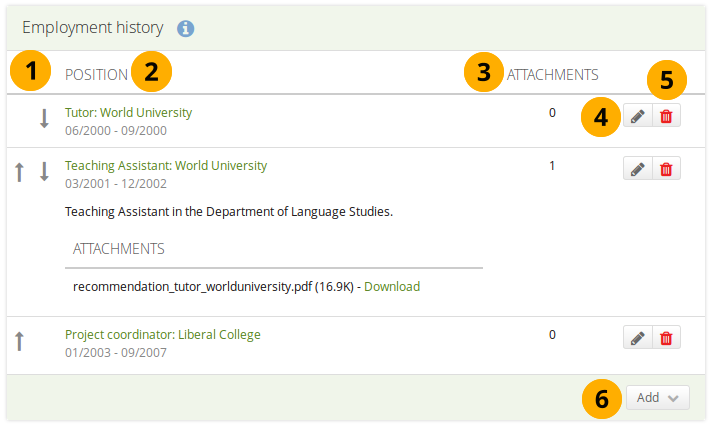 Like other artefacts, you can select a license for your résumé. License: You see this field if the site administrator turned on license metadata. Choose the license for your résumé. You can set your default license in your account settings. 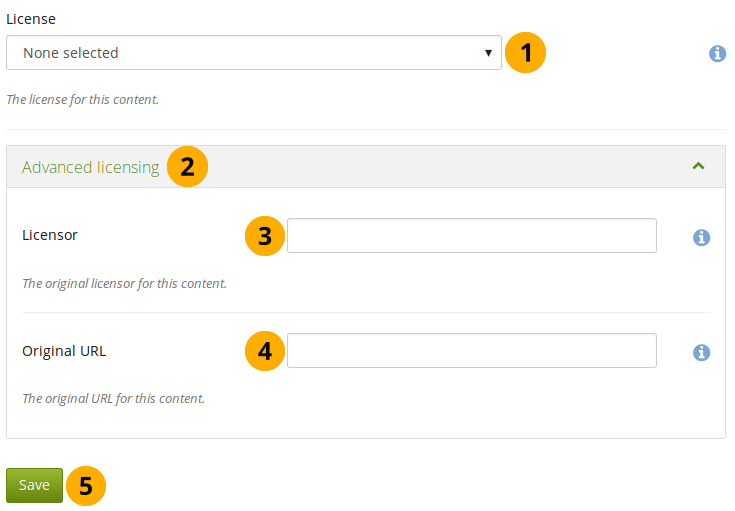 Click the Advanced licensing link to see more options.